da Vinci Surgical System is the most progressive robotic laparoscopic technology available anywhere in the world today for urologic, gynecologic, and certain other surgical procedures. With this technology, even major surgeries can be performed through the smallest of incisions. The da Vinci Surgical Robot is also used in oral cancer surgery. Read more. Hybrid Endovascular Suite combines endovascular, cardiac surgical, laparoscopic, and radiological capabilities, allowing flexibility and speed in the treatment of patients with the most complex cardiac and vascular conditions. Read more. Advanced technology that is included in the Hybrid Endovascular Suite is IVUS, Intravascular Ultrasound. IVUS is a catheter-based system that allows physicians to obtain images of diseased vessels from inside the arteries and to perform intricate endovascular stent grafting. Read more. The Stryker Navigation System for total hip and total knee replacement surgeries offers a technology that can assist in more accurate implant alignment and proper ligament balancing, which are essential for the artificial hip joint and knee joint stability, durability and sufficient range of motion. Read more. The addition of the MAKO Robot demonstrates United Regional’s commitment to precision medicine and expands our regional leadership in robotic surgery. Read more. Surgery of the spine requires planning and precision, and each patient’s anatomy has unique challenges. 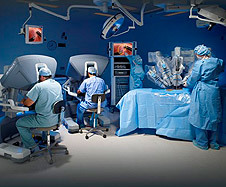 Surgery with the robotic surgical guidance system allows neurosurgeons to plan ahead before entering the operating room. Read more. In delicate brain surgery, surgeons rely on advanced magnification and visual clarity to enhance their skill. In 2011, we acquired the Zeiss OPMI Pentero neurosurgical microscope, which provides surgeons with clearer and more powerful magnification, as well as inter-operative diagnostics and support of fluorescence-based procedures such as tumor removal and resections. With these capabilities, neurosurgeons can easily distinguish between the cancerous tumor and healthy tissue. Read more.